Special coins commemorating events in the reign of Queen Elizabeth II are normal for several major mints with current or past ties to the British Empire, which once spanned the globe. In 2015 there were two celebrations, one well known and one known mostly among coin collectors. The reign of Queen Elizabeth II became the longest reign by any monarch of the United Kingdom, and going back in history it eclipsed the reigns of every English monarch before the United Kingdom even came about. Whether one is in favor of a monarchy or not this is indeed a major event, and has been newsworthy throughout the world. The other event, one in a sense related to the long reign of Queen Elizabeth II, is that many major mints have once again changed the effigy used on coins of Queen Elizabeth II to the fifth effigy used during her reign. The images are allowed by the affiliate programs that make the items available. In other years milestones such as the Diamond Jubilee of Queen Elizabeth’s reign have been honored on coins. 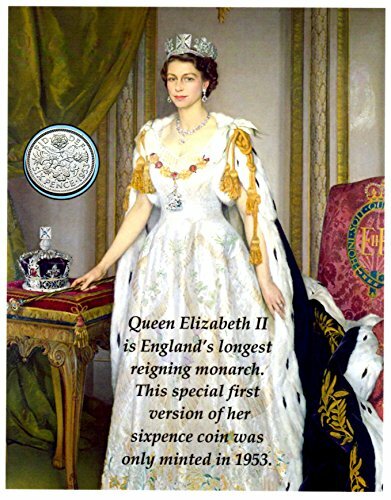 In fact, Royal Births, Royal Weddings, and other significant events of the Royal Family have been chronicled on coins. One that brought about a prolific number of coins was the eightieth birthday of the Queen Mother, who was arguably the most popular member of the Royal Family. Designing a coin is not without expense, and the artistry and engraving processes take time. Many major mints had coins ready for the event, but wanted even more coins for release. Had something unfortunate occurred before Queen Elizabeth II became the longest reigning monarch in history there would have been a major problem, so many coins honoring the event were somewhat delayed. Of course the Royal Mint participated in honoring the reign of Queen Elizabeth II, and has produced a number of coins for the occasion. 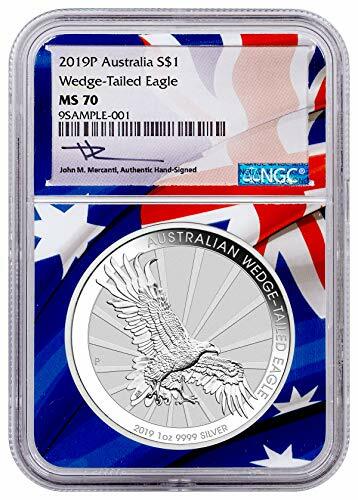 Coins in the three precious metals of platinum, gold, and silver have all been minted, and high quality proof coins are available along with specimen coins. Some are large, and expensive, others are smaller and less expensive. As for affordability I recommend the base metal cupro-nickel coin that the Royal Mint has listed for thirteen pounds. 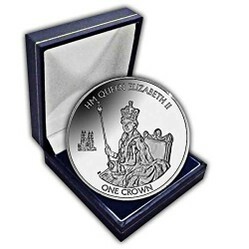 A better bargain is the 15.71 gram fine silver twenty pound coin available at face value. This is a coin that can always be spent for twenty pounds, so it is a real bargain and costs nothing more than shipping charges. The effigy change is honored at the Royal Mint by making available mint and proof sets of both the fourth and the fifth effigies. The two designs below are in use for the Royal Mint's coinage. There are several coins with these designs, and they are so numerous that they appear on two different pages. The silver coin is linked to the page with most of the coins. The images are all linked to the Royal Mint's site. The Perth Mint has released coins honoring Queen Elizabeth II and her long reign minted in gold, silver and base metal. The base metal coin was paired with a stamp as a set, and is no longer available at the mint. 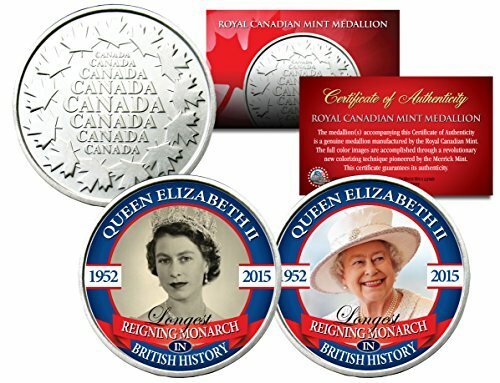 The Royal Canadian Mint has produced both individual coins and sets of coins commemorating the reign of Queen Elizabeth II. Coins have been minted in gold, silver, and silver enhanced with gold. The silver enhanced with gold fractional set is particularly nice. The coins are available at the Royal Canadian Mint. My purpose in writing this has little to do with the queen, rather it is for coin collectors. I have a website and also use Ebay to sell coins, and initially I got into writing articles to get more visitors to my website. I now find it easier, and less of a risk to sell coins by affiliate programs. The coins shown are because the three mints are on Viglink,. However, I came to enjoy writing, and so I have fewer coin articles than when I was writing elsewhere. And I have learned to advertise a wider range of products, which are far from great sellers. If it was not for the enjoyment of writing I probably would not continue. This is a matter of writing about things (coins) I know. But I am being enlightened by the responses from those in England. The only positive is we shall soon change the president. His two term limit is soon to expire. What the real problem is goes to the young voters who believe what is said, and do nothing to check the facts. An offer of change does not always mean changing for the better. You have a monarch for life, except if the monarch chooses to leave, like Edward. Of course some monarchs never make it to the throne, like the young princes under Richard's charge. A mystery we can speculate upon, but will we ever know? I must say, in reality your monarch can do little real damage any more, nor effect much good. Ages ago that was quite different. It is interesting to get responses from England. I appreciate the comments, as they are enlightening. I am a benign, inactive republican. This means that while I do not believe in monarchy, I am not interested in doing anything about it, and I do not hate or dislike the royal family. The reason for my views is that while I have republican beliefs, I acknowledge two factors: one, that most Brits support the monarchy; two that a good monarch is better than a bad president, and that is the current state of affairs. There would appear to be a world wide opinion that the Brits adore the monarchy. They don't all. There were many comments about how 19 million people watched William and Kate's wedding in 2012. But out of a country of 61 million people, 19 million isn't that many. There main function is to bring foreigners in to spend money. lots and lots of it. Coins such as those above, flights, tourism, eating out, days out. When the latest royal was born, a princes to William and Kate ( I don't even know what her name is ) people who I know around the world sent me congratulations emails. I don't even know what the child's name is and I don't want to either. It must be a difficult situation where one is forced to keep a system with not real function other than symbolic. Yes indeed. You are right. Most people in my family and social circle are anti monarchy. But those who don't understand it or who are unaware of how they acquired the throne by stealing, murdering and other ways are fanatical about it. I don't think the Queen is barring Charles as such . I think she is a traditionalist and will see her role as vocational as she is a good person. Charles is an absolute plonker and idiot so maybe she's keeping him at bay although at 67 he's a pensioner himself. I can see how people are opposed to the monarchy. I am curious as to whether the long reign is to block Charles from the throne as long as possible, or not. I suppose she could retire if she wanted to do so, but that might lead to worsening situations. His popularity is probably even lower. But, there are those who favor the monarchy, and they might appreciate a remembrance. Different people certainly see the monarchy differently.. It was a work day as usual. There was no celebration ; there was a mention on the news. I am totally disinterested in the monarchy and her family of spongers whom we keep and pay for out of our small wages. It went relatively quietly compared t the Diamond Jubilee, but still was a major event. When Her Majesty Queen Elizabeth reached the milestone of becoming the UK's longest reigning monarch, it really was quite something. She is truly respected and even adored around the world.